The Makeup Box: Lime Crime Carousel Glosses: Lipgloss for Lipstick Girls? Lime Crime Carousel Glosses: Lipgloss for Lipstick Girls? 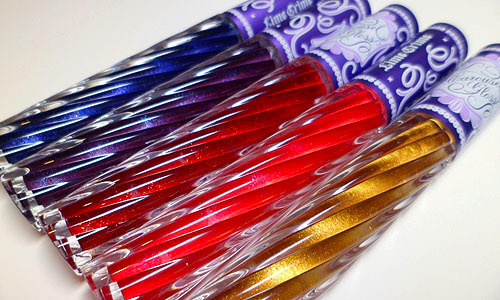 I used to be a gloss lover before I got into blogging. I loved it for the same reason most girls love lip glosses. The versatility and low maintenance, and how it juices up your pout with subtle color and shimmer. Well, there-in lies the problem which I discovered the MOMENT I tried to do lip swatches for a post. In stronger lighting and zoom, half of them looked like a smattering of barely-there shimmer over clear gloss. The difference was quite minimal, and I finally understood why "signature lip colors" are mostly lipsticks. In real life, with most of the generic shades around, nobody else can really tell one pink gloss from the other on your lips (or a peach one to tell the truth). So in the past year, I've pretty much stopped using colored glosses on their own. When I first heard that Lime Crime was coming up with a line of limited edition sparkly glosses in zany colors, I thought "Nah. They're probably like MAC Dazzleglasses." Lime Crime Carousel Gloss, boxed. Reminds me of European chocolate pastilles! Dear readers, I was so wrong. I tried my best to capture the sheen, intensity, opacity and texture of the glosses as best as I could here. And yes, honey, they do go on that strong. The closest comparison would probably be to MAC's Dare to Wear Lipglasses from 2010, but in more outlandish shades. View the more detailed review and lip swatches here! wow your review is intense, concise, very good read straight to the point. i love the intensity of the glosses. Thank you Steffi! Yes, they're really intense, so it's more of a special occasion gloss for me because I don't wear them sheer, and you really need to take your time to apply them nicely. They look so BRILLIANT. I'm also strongly tempted to use these for a shiny/glossy eye look. Yes! I actually tried to do one with Golden Ticket, but it didn't turn out so good because I dabbed it only in the center of the lid, haha. I think you'd need to really cover your whole lid for it to look good.